There's a lot we can learn about our climate history and future by studying tree rings. FAYETTEVILLE, AR. – Scientists studying annual growth rings of trees rarely get the glory that occasionally comes to archeologists who dig up ancient treasures. These dendrochronologists only infrequently get budgets the size of those awarded glaciologists, who drill miles-long cores of crystalline ice down into glaciers. Let’s give these tree cognoscente their due. Take, for instance, David Stahle, director of the Tree Ring Laboratory of the University of Arkansas. Stahle dresses unpretentiously in leather boots, jeans and checked shirts. He keeps a pair of rimless reading glasses in a chest pocket, and dons them frequently for consulting a reference book or looking up an item on his computer. Stahle says many trees grow a new, identifiable ring every year. Under the right conditions, the width of each ring correlates with fluctuating temperature or precipitation. Once they have established the relationship between the behavior of trees in a region and one of these parameters, dendrochronologists can recount climate conditions yearly since long before scientific instruments or even hand writing appeared. By cross referencing measurements of the oldest standing trees with those of dead stumps that lived still earlier, these lords of the rings have shown that beneficent weather has spawned some ancient civilizations and that drought has crumbled others into dust. By counting and measuring tree rings, Stahle himself proved that drought probably doomed the Jamestown settlement in the late 17th century, in the Colony of Virginia. The settlers, he showed, pulled ashore a year into the region’s driest seven-year period in 800 years. 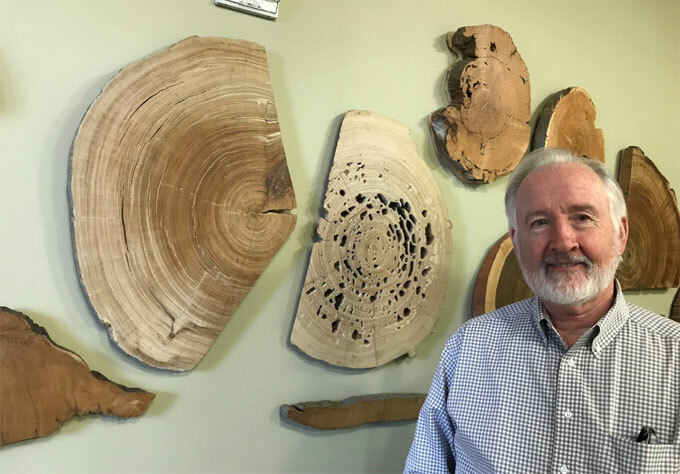 In recent decades, dendrochronologists have discovered an important new calling: helping determine whether the shifts of modern weather are benign normal variations or ominous signs of a shakeup of the climate. Researchers especially want to learn more about past precipitation in the world’s tropical jungles, where meteorological stations are rare and recent. For instance, the Amazon Basin – an area almost the size of the United States – has hardly any reliable precipitation records that date before 1960. “That’s a classic kind of environment where tree rings can be useful,” Stahle says. Trees are both a potential remedy for the lack of climate data in the Amazon and a critical reason why scientists want it. Trees absorb about twenty-five percent of the carbon dioxide flowing up the stacks and out the tailpipes of industrial society. Numerous lines of evidence suggest that a large fraction of the gas ends up stored in the trunks of trees in tropical forests. Rainfall could influence the health of this natural carbon capture machinery. If rains fail and these forests weaken, the pace of climate change increases. The Amazon has experienced three exceptional droughts in the past fifteen years, indicating to some scientists that a decline in rainfall predicted in some powerful climate models might have begun. Oddly, extraordinary rainfall and flooding have also drenched the huge jungle recently. “Why is this happening?” Stahle asks. “It’s a major scientific question.” With help from stacks of tropical logs slated for the lumber mill, Stahle is seeking the answer. Stahle picks up a polished slab of Spanish cedar roughly the size and shape of a cutting board. Collaborators in Brazil had sawed it from a cross section of a trunk, like a rectangular slice of a round pizza that includes both the center and an arc of crust. The tree it came from must have been too thick to reach around when a logger in the Amazon cut it down. “These are real rings. You can see these,” he says, pointing at alternating bands of light and dark wood arrayed from one end of the plank to the other. It might not seem extraordinary to find tree rings on a piece of wood, but Stahle explains that their rarity in the tropics has long hindered scientists studying the climate history of the Amazon. Not all trees produce rings. Hardly any of the Amazon’s 7,000 scientifically described trees do. Because the tropics lack the pronounced warm and cold seasons that, in temperate regions, accelerate and then retard growth, visually contrasting bands often don’t develop. Until not long ago most scientist doubted that even the few tropical species known to display identifiable rings – perhaps created by transitions between dry and wet seasons – recorded decipherable climate records. But in the last decade-and-a-half a handful of scientists have discovered climate signals in tropical trees, overturning that long-accepted wisdom. Stahle has teamed up with Daniela Granato-Souza, a biology professor at Brazil’s University of Lavras, and with other colleagues in Brazil and the U.S., to identify the species best suited for chronicling the history of rainfall in the Amazon. He says their work has been complicated by the baffling anatomy of the trees that seemed most promising for study. Stahle says that to extract climate data from such uncooperative subjects, he can’t make do with a simple tree core, the kind of sample dendrochronologists typically collect. Such slender plugs of wood augered out of trunks don’t contain enough volume to show what’s going on under the bark of his tropical trees. He needs samples containing a substantial fraction of each tree’s cross section – like the planks in his office. And he needs many specimens to average out the anomalies of individual trees. But getting substantial pieces of wood isn’t easy. Coring a tree doesn’t hurt it. Cutting off a cross section with a chain saw does. If there’s a silver lining in the construction of Brazil’s Belo Monte Dam – due, when completed, to be the fourth largest hydroelectric plant in the world and an environmental disaster in the minds of detractors – it’s that the massive development has provided Stahle with a large collection of samples suitable or his studies. In 2013 Stahle and Granato-Souza flew to the Xingu River. The complex was under construction. Huge swaths of land had been cleared, making room for the power station. “If you’re a tree hugger and lover of trees like me, to see them cut down on an industrial scale – it was a little shocking.” But Norte Energia, the dam’s owner, permitted them to collect slices of hundreds of trees felled for the project. During Granato-Souza’s earlier career as a police officer (she has a black belt in judo) she enforced forestry regulations. That gives her experience useful at rough and tumble logging sites, Stahle says. In May 2018, Stahle and several colleagues published their first paper on the eastern Amazon, one of the wetter parts of the jungle. The record they derived dates back to 1786. They documented a previously unknown 18-year-long dry spell—between 1864 and 1870 – as prolonged as any ever reported in the Amazon. The finding might suggest that droughts like those observed in recent years likely occurred before global warming began altering the Amazon’s climate. Stahle says drawing any firm conclusion would be premature. He’s given science one hundred extra years of precipitation information, but only for one particular spot. Climate change is widely understood to be an emergency. But science, like the growth of trees and the advance of glaciers, moves slowly. And glory to scientists, if it ever comes, lags sorely behind.